First of all, it is not a book for the general public. Despite its title, The Art of Language Invention is not a popularization. Yes, it looks like an ordinary trade paperback… but I repeat that it is not for the general public. Perhaps the phonetic notation gives that away. To make matters worse, the publisher (Penguin) slapped an even more misleading subtitle on the book: From Horse-Lords to Dark Elves, the Words behind World-Building — thereby reinforcing the incorrect notion that it is intended for the general reader. Actually, this is a technical linguistics textbook — an excellent one in fact. It’s filled with sentences like “Both of these phenomena are instantiations of tone sandhi.” That makes sense to anyone who has studied linguistics. But to the general reader? Not so much. I’ve been interested in language construction for literally as long as I can remember — at least back to when I was 12 years old. Although I would never qualify as a conlanger in the spirit of this fascinating book, I was immediately captivated by everything that author David Peterson had to say. You could be too, as long as you’re not intimidated by the technical material. The book is dense, but it reveals a fine sense of humor and repays careful study. 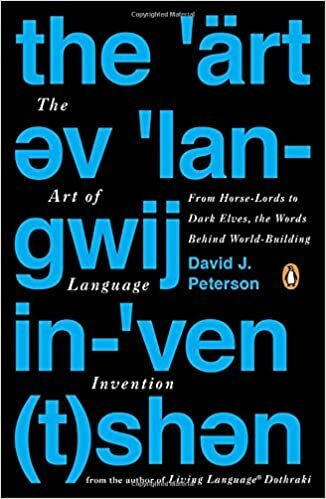 Peterson, by the way, is the creator of the Dothraki language for Game of Thrones, so you can be assured of his expertise and knowledge of the subject. How do I know that you don’t have to be a professional linguist to be a language constructor? Because I’ve seen a wide variety of high-school students succeed in the language construction endeavor, back in the ’70s when I taught a course called Languages of the World. You don’t really have to be a professional linguist, but you should at least be a geek.